We and Richard Berner have been studying how regulators use stress tests (see our earlier posts here and here) to assess the resilience of financial networks, including banks and nonbanks. In our joint work, we focus on CCPs due to their centrality, their extreme interconnectedness and their lack of substitutability. This post is based on our research. The good news is that regulators are devoting substantial resources to making CCPs safe. A key step in that process is mapping the global networks in which CCPs form critical hubs. The figure below illustrates the linkages in 2017 across 15 jurisdictions among 26 CCPs and their top 25 clearing members (CMs). 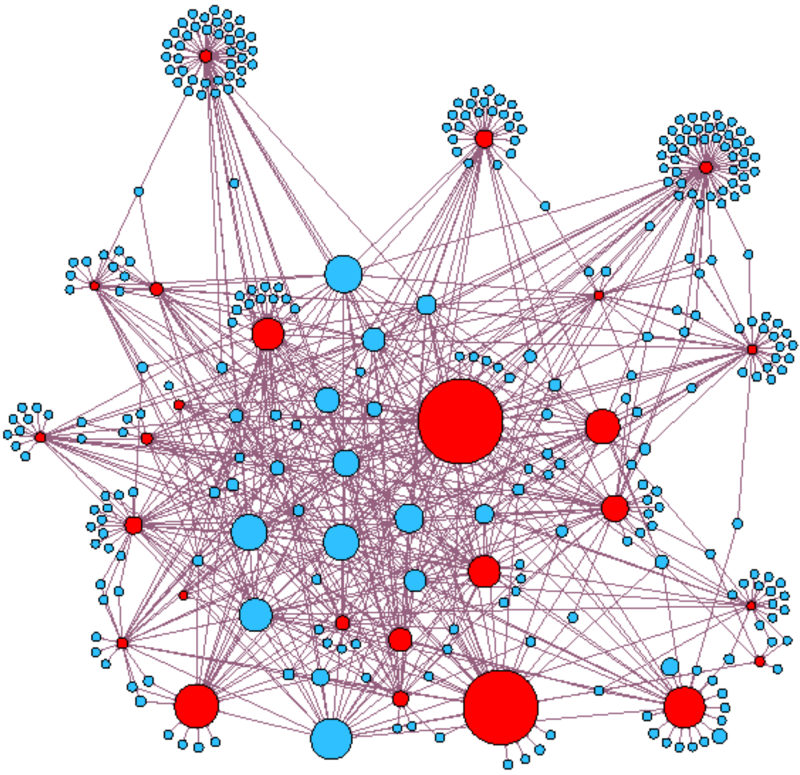 The size of each CCP (red circle) is a proxy for the credit exposure to its CMs, while the size of each CM (blue circle) reflects the scale of its resources posted at the CCPs. The figure reveals both the high degree of interconnectedness and the complexity of the network as well as the concentration both of credit risk in a few CCPs and of pre-positioned resources in a somewhat larger number of CMs. Source: Figure 3 in Analysis of Central Clearing Interdependencies, August 9, 2018. Having identified key hubs in global networks involving CCPs, a next step is to assess their resilience. Are the CCP’s resources sufficient to absorb the losses from the default of one or more CMs? Should a CM be unable to meet its obligation to post variation margin (as required when a derivatives price moves against it), the CCP will deploy those loss-absorbing resources in a sequence known as a waterfall (see figure). Source: Treasury Office of Financial Research, Figure 1. The CCP’s first line of defense in the event of a CM default is the initial margin—the collateral posted for each trade by the CMs engaged in the trade. Each CM also contributes to a prepaid guarantee fund. Should initial margin be insufficient to restore the CCP’s matched book of trades following a default, the second line of defense is the guarantee fund contribution of the failing CM. The third element of the waterfall is the CCP’s own capital. After that, the CCP taps the pre-paid guarantee funds of the other CMs. In the fifth and final step, there is a loss-sharing arrangement—ex post assessments—in which the solvent CMs are required to contribute once all of the pre-funded backstops are exhausted. The following table shows the scale of the elements of the waterfall for two large CCPs: the Chicago Mercantile Exchange (CME) and LCH Clear. Initial margin is the dominant part of the loss-absorbing buffers: for each CCP, it is more than 10 times larger than the potential assessment. However, the entire buffer appears small relative to the scale of these CCPs: while open interest surely overstates CCP counterparty risk exposure—especially for short-maturity instruments—for LCH, the entire loss-absorbing buffer (including the assessment) is less than 7 basis points of the total. Source: Authors’ calculations based on CPMI-IOSCO quarterly disclosures (CME, LCH1 and LCH2). Note that the CME does not disclose the total value of either open interest or gross notional amount outstanding. To gauge the adequacy of CCP loss-absorbing resources in the face of a large shock, both the U.S. Commodity Futures Trading Commission (CFTC) and the European Securities and Markets Authority (ESMA) have conducted stress tests of the leading CCPs subject to their jurisdictions, focusing on their credit risks (here and here) and liquidity risks (here and here). A key question is whether a CCP can meet its obligations without recourse to assessments that may transmit shocks in a period when the system is already strained. Both authorities’ conclusions are reassuring: for example, in the 2016 CFTC credit exercise, all five of the CCPs had sufficient pre-funded resources to manage the default of their two top-ranked CMs. From our perspective, a key concern is the high cost and low frequency of supervisory stress tests. Requiring vast amounts of granular, detailed information, such tests are complex and time-consuming to implement, often taking months to complete. While the Federal Reserve carries out bank stress tests annually, the U.S. and European markets regulators with CCP oversight authority have undertaken just two tests each since 2015, when these reviews began. Yet, rapid changes in market and institutional conditions can affect the vulnerability of CCP networks in the long intervals between these tests. For that reason, supervisors should develop, implement and publish high-frequency tools for monitoring CCPs that can help identify emerging risks. When conditions in the financial system are changing rapidly, such reporting could help focus regulatory scrutiny and trigger customized stress tests. Measures based on market information seem like a promising avenue to pursue for this purpose. To see what we mean, consider the vulnerability of the financial system to a CCP assessment should its waterfall be partially or completely depleted. Rather than current tests that evaluate the adequacy of the CCP’s pre-funded loss-absorbing capacity, our concern here is the impact of such a CCP action on the financial system. While such events are rare, they do occur: in September 2018, within days of the default of one individual trader, the Nordic Nasdaq CCP called on its other CMs to replenish the guarantee fund (see Bell and Holden). This Nasdaq episode highlights how a disruptive CCP call on its CMs’ resources can occur at the fourth stage of the waterfall, even before the CCP guarantee fund is exhausted. To study the possible impact of a CCP assessment on systemic stability, we compute an index based on a weighted sum of the SRISK of the CMs of the CME and of the LCH. A product of the NYU Stern Volatility Lab, SRISK is a weekly, market-based measure of the capital shortfall (relative to a benchmark) of a financial institution in the event of a 40 percent decline of global equity prices over a six-month period. The idea behind SRISK is that the spillover on the financial system from a shortfall of capital at one entity is greater when the entire system lacks adequate capital. (A useful analogy is to a lightning strike in a drought-plagued forest). The same goes for a CCP: the impact of a CCP assessment on the financial system will be greater, the bigger the CMs’ collective capital shortfall. In effect, a CCP assessment is a call on the financial system’s capital that is most likely to occur when it would be most damaging, in an episode of widespread financial distress. While regulators presumably know the potential assessments by a CCP on each individual CM, this information is not public. Consequently, in the next figure, for both the CME and LCH, we use weights based on the gross notional derivatives exposures of each CM’s parent (most are subsidiaries of large banking groups). We then set the indexes to 100 at their common peak (February 2009). Note: The plot shows the weight sum of SRISK of the publicly traded parent firms of CMs at the CME and LCH using weights based on 2017 gross notional derivatives exposure. Sources: Authors’ calculations based on data from the NYU Stern Volatility Lab, Basel Committee on Banking Supervision and various firm disclosures. We draw two conclusions from these calculations: first, reflecting the improved capitalization of banks worldwide, for both the CME and LCH, the weighted SRISK index is less than half of what it was a decade ago. Second, because of the large overlap in CMs, the two indexes move closely together (with a correlation of 0.998). The implication is that when the financial system is vulnerable to a CME assessment, it is also extremely likely to be vulnerable to an LCH assessment (and vice versa). Put differently, as one might suspect from looking at the first chart of the global CCP network, an assessment will transmit the shock among the CCPs. In the next figure, we disaggregate the CME SRISK index by region. Here we use weights based on posted client margin. These margin weights are a better proxy for the CCP’s assessments, but are only available for the CME. (The change in weighting has little impact on the total index: the correlation between the CME indexes in the preceding and following charts is 0.993.) The striking result is the portion of the CME’s vulnerability emanating from Europe (the green shaded area), which ranges from 30 to 50 percent of the total. The message from this exercise is that through capital assessments the CME can transmit shocks from defaulting European members to other CMs inside and outside the United States. Note: The index of client-margin-weighted shares of CME SRISK decomposed by world region. The fraction accounted for by Canadian clearing members is never more than 0.6 percent of the total, so it is included in the U.S. total. Source: Authors’ calculation based on data from the NYU Stern Volatility Lab and FIA. The bottom line: in light of the ongoing effort to map and monitor global CCP networks, we expect continued advances in supervisory stress testing of CCPs. Regulators can utilize these tests to assess margin requirements and the adequacy of pre-positioned guarantee resources. High-frequency market-based indicators such as SRISK can complement these supervisory tests. Finally, supervisors can further enhance financial resilience by making their stress testing data, process and results increasingly transparent to CCPs, CMs, their stakeholders, and the public. So long as CCP governance allows, such transparency (including publication of CM-specific potential assessments) would permit healthy CMs to impose greater market discipline on the CCPs with which they transact business. Rather than relying primarily on administrative interventions, supervision usually is most effective when it promotes such discipline. Acknowledgements: Without implicating them, we would like to thank Robert Engle, Richard Haynes, Til Schuermann, and Bruce Tuckman for helpful discussions. We also thank the NYU Stern Volatility Lab for providing firm-level SRISK data.